Eli Apple Begins 2018 With a Clean Slate, Can He Find His True Potential? Home New York Giants Eli Apple Begins 2018 With a Clean Slate, Can He Find His True Potential? To say Eli Apple had a disappointing sophomore season in 2017 would be an understatement. 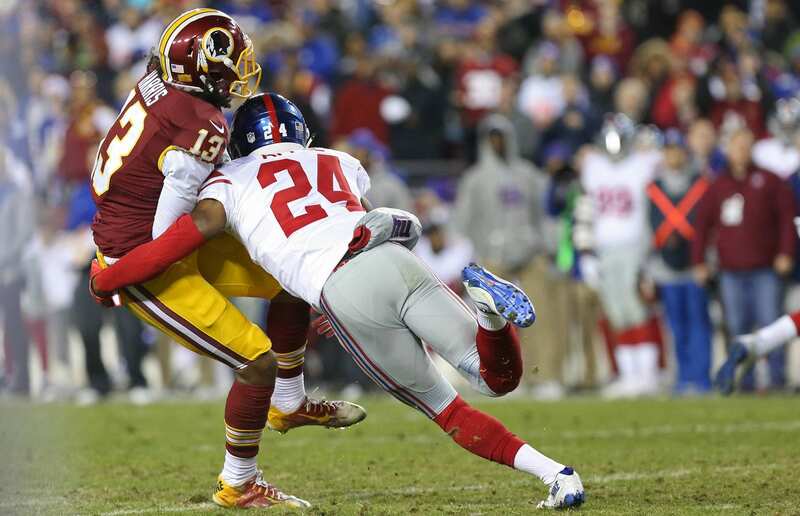 The New York Giants’ 2016 first-round pick finished his impressive rookie season with a lot of optimism and the thought that he would continue to improve. Apple seemed to regress quite a bit from the previous season and he was also one of three defensive backs that were suspended throughout the season. Let’s also not forget when Landon Collins publicly called Apple a “cancer” in the locker room. Can Eli Apple get back on track? Everyone in the Giants’ organization seems to think so. GM Dave Gettleman and head coach Pat Shurmur have both publicly stated that everyone starts with a clean slate. New defensive coordinator, James Bettcher. recently stated that “Day 1 is Monday,” when asked about Apple. It truly seems that the past is the past and the New York Giants are working towards the future. If Apple is able to overcome or forget about any of the issues he had last season, there is no doubt he can get back on track and help be one of the top defensive backs on his team. Eli Apple seemed to let distractions get the best of him last season, and as a young player, I expect him to learn and grow from that experience. Eli Apple is only 22 years old coming into his third season in the NFL. Apple has bright future and my expectation is for him to be a long time starter for the New York Giants. The former Ohio State corner put up lackadaisical numbers in 2017 (41 tackles and eight passes defended). He was also suspended for one game and accused of anonymously ripping the coaching staff. Apple will now receive a third chance if he decides to go haywire again in 2018; the young corner must know that his future in the NFL hangs in the balance.